Yorkshire county player Richard Pyrah is to stage a benefit game on his home ground of Ossett CC this Sunday (August 16), start 1pm. The match will see an Ossett XI, including Pyrah and former county batsman John Sadler, take on Heavy Woollen Cup winners Woodlands. Ossett have drafted former junior Joe Finnigan into their side along with his current Townville teammate Jack Hughes. Pyrah had a spell with the JCT600 Bradford League Division One title challengers earlier in his career and Woodlands have vowed to play the majority of the side who overcame Hoylandswaine in the Heavy Woollen Cup final at Ossett a fortnight ago. The game is being staged in recognition of Pyrah’s long association with the Ossett club as both a junior and senior player throughout an outstanding career as a county cricketer with Yorkshire. With Yorkshire not in action last weekend, Pyrah turned out for Ossett and produced a match winning performance against Hunslet Nelson. Pyrah picked up the first four Nelson wickets to fall on his way to figures of 5-35 and was unbeaten on 16 not out as Ossett completed a five-wicket win. 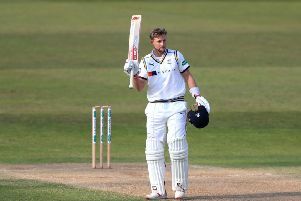 Pyrah has played 51 first class matches during his long career with Yorkshire, which has seen him score 1,621 runs and claim 55 wickets. In recent years Dewsbury-born Pyrah has become a specialist one day all-rounder, playing 116 matches, scoring 1,083 runs and taking 140 wickets for the Tykes. The 32-year-old has also played 105 Twenty20 matches for his county, scoring 593 runs and claiming 108 wickets. Ossett are looking forward to welcoming cricket fans from across Yorkshire to support Pyrah, with further information on the day available from Bob on 07846 754059 or by e-mailing enquiries@richardpyrahbenefit.co.uk.